Minus the tensions, It’s a lovely day. Rain is pouring down. I’m loving the weather. And I have grown fond of drawing. I love. Love. Love drawing things now to ruin the perfect architectures with my tilting lines. 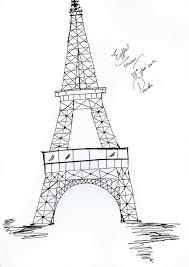 Here’s my first ever sketch of Eiffel Tower. And I am kinda proud of it you know–given the case history of horrible sketching of mine. Please ignore the top antenna thing which is absent. I ran out of paper space for that. Enjoy the rest of the structure. It was pretty technical but easy to draw. The hardest part was to sketch straight lines here. Pray I get better at it. 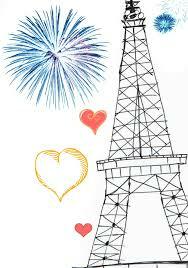 And I had to use picture monkey to draw some digital hearts and fireworks with this. It’s About time now, I posted something new. Something about the colors I have been showing recently. On canvas. Last few months have been really hectic for me. I wanted to relax, take a break and paint anything. Just anything to know colors. But tough routine wouldn’t let me concentrate on anything other than work. That routine is over now, I have few months to live for myself until the busy days come back to haunt me again. I can paint. But despite all that, I am unable to do so.Why? Because maybe the perfect time for me to paint was during the most maniac days of mine. 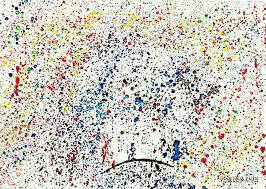 The bizarre abstract piece above, is what I created during the most mad busy days of my life. As a therapy you can say. I was tired and hell taken away with everything that I decided to take a few minutes break. I didn’t know what I wanted to draw. I am not really good with colors , I can’t draw a straight line. But despite all that, I wanted to do it. After spending 30 mins with ridiculously not so vibrant art–the type that doesn’t make sense, I got back to my work. And today when I am really free to do anything, totally relaxed, not under any stress. I realized something. I can’t do it. Creativity has a time of its own. It doesn’t demand leisure time. It demands you. 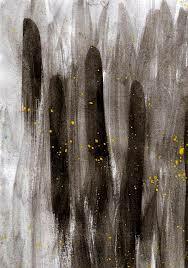 You– your inner demons awaken and to be willing to come out. If Your mind is racing with anything mad. It is good enough to perform. Art or no art, Scanning this work, looking it close up now after throwing it away at first, I realized I actually like the magnified view of the brush strokes. I don’t know, it maybe ugly but I’m in love with this beautiful black demon running ahead, engulfing everything. Killing! showing no mercy! But colors are still blooming out. Everything is in a recycling order in this universe, isn’t it. What a beautiful chaos it is. They say art therapy speaks a lot about the person’s mind. I wonder what does it say about mine. 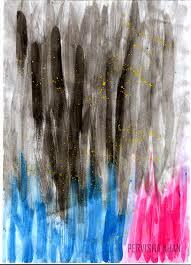 Tags: art, art therapy, bipolar disorder, color of the soul, demons and angels within, painting, spirit, stress. Assalamo Alaikum everyone! I hope your winter is going well, warm and cozy. The worst perhaps is that you caught a flu or fever or a runny nose. But nothing that serious, right. You survived. There are people in this world who have nothing to cover themselves with in this harsh season. Many are unable to survive. While the number of masses is huge, from every country, The people hit by “civil war in Syria” is the top story on World news. At least for Muslims. After Palestinians and Ethiopians, I believe, the Syrian children have also been struck by the miserable fate. They need basic necessities of life to survive. Last month I was invited to attend a such fundraiser for Syrians. As it turned out, I also got the opportunity to volunteer at the event. The experiences I had there, were heartbreaking. Event was about to start, yet hardly a dozen had arrived. The reason was short notice announcement of the fundraiser by the organizer society. Alright. No worries there. By the Grace of Allah, slowly but surely, people began to pour in. The hall seemed full of souls now. 20 minutes to start. I received a call from a family friend who hasn’t been in touch with me for like months,perhaps years. Happy, I attended the call immediately but to my surprise, the call was merely a joke to question the forwarded text I had sent them earlier informing about the fundraiser. I was being questioned as to why am I concerned about Syrians all of a sudden, and was advised that I must take care of myself first, then Pakistanis and then if my heart allows me , should I bother about people outside borders. I knew now, why Muslim nation is facing a downfall. We can never be united under one banner. Banner for Humanity. I’m not going to type my anger out at that funny call. Just out of respect, I am in favor to let it go. But this much I would definitely say, If anyone of you do not want to come forward and help for any reason, no worries, just quietly move aside. Don’t mock my dears,don’t make fun, don’t comment, just aram se let it go because we never know what action of ours may become the cause of our destruction in the sight of Allah swt. Whenever there’s a disaster in Pakistan, Our nation receives a flood of donations from around the globe, whether from Muslim or Non Muslims. Is it then anything wrong on our part if we , for once, try to help out people living outside our borders? Regardless of their ethnicity, color , religion or country of origin. I have never attended any fundraiser for any civil war victims before, nor have I been aware of the organizers of the event before, but since a good friend of mine was the source of invitation for this event, all I had to say, keeping my schedule in check, was: Labbaik! There are children out there, people. Children who are dying on hourly and daily basis. I don’t care who is right or wrong in this war but my religion teaches me that children are never to be harmed in any war between two groups. People who attended the event donated in numerous forms. I was amazed by their compassion to come forward and donate. A guy, as I observed, gave away his silver engagement ring. 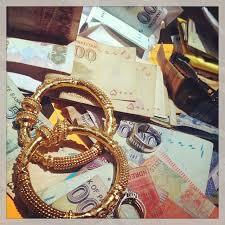 A woman gave away her gold bangles after being motivated by the speech of the people on stage. While all they asked for is clothes! Yes. This winter appeal is basically to gather warm winter clothes and tents to send to the victims who are living in the open area without a proper roof on head. I am writing this post to deliver you all, the message of this appeal. Please, come forward. If you feel satisfied with the organizers, donate. Gather warm clothing and just send it to the address mentioned below or contact the people who are doing this work. The time is short. 2 more weeks I believe, till this appeal closes down. P.S. I hear Yusuf Chambers, is going to be a speaker at Winds of Change this month. Unfortunately I am unable to attend that event but any of you interested might want to check that out at Youth Club! Tents, socks, sweaters, clothes, gloves just anything warm is welcome for donation. I do not own the pictures presented in the post.